Are Dog Crates Good for Your Pet? 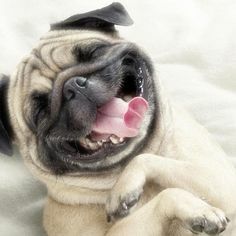 Have you just recently brought a new canine friend home? Do you adore it despite the havoc it seems to be creating all around your house since its arrival? Well, no matter how much you love the furry fellow; you will eventually have to allocate a separate place where it can relax after a tiring day. Don’t worry because buying the Petco Classic 1-door crate will serve this purpose well. Besides, the crate is a terrific tool for the behavioral training of your puppy. Petco has been serving since long as a one-stop shop for various pet supplies. Over the years, the company has emerged as one of the top-selling brands of dog crates. If you are still not convinced for buying this brilliant den-like space for your pet, then scroll down to read more about its features. Once done, you are sure to head out and make the purchase. “Simple design yet excellent in quality” is what this pet crate can be described as. This is basically a wired dog house, which features a single door for the entry and exit of your pooch. This way, the canine will easily learn how to get used to its den, and you won’t have to stress about locking multiple doors each time you decide to leave the animal inside. The kennel is constructed with high-grade metal wires, which make it a sturdy and reliable place for your pet to stay in. Moreover, it is built to easily withstand the animal’s weight, as it grows. This wired cage comes with a baked powder coat finish that protects it from the impact of moisture, scratches, weather conditions and corrosion. While manufacturing this product; Petco has given utmost importance to not only the comfort but also the safety and security of your pet. This is why, the door of this wired dog den has the option of being secured by a slide bolt lock. Now, you can feel relaxed when stepping out for work after shutting your beloved pooch inside. Dog owners can easily set up this safe haven for their pet as it does not require any professional help or additional tools for assembly. Just bring it home and assemble it within minutes. You can even fold and keep the den aside when it’s not in use. The crate features a slide out plastic tray at the bottom, which serves as its floor. This makes cleaning the kennel super easy, and also ensures the hygiene and comfort of the furry creature. Besides, the tray is hard to crack so there is no way of accidentally destroying it while slipping it out or back in, or during washing. You can find dog crates that are available in different sizes, but this particular one can accommodate your pet from its infancy to full adulthood. Wondering how is that possible? Well, it comes with a divider panel that allows you to adjust the space inside accordingly, as your pup grows. Nonetheless, your beloved canine can enjoy a great space inside to lie down, stretch, play and have a good time overall, when it’s not roaming around your house. It’s true that metal cages can be difficult to move around, especially when occupied by the pet, however this isn’t one of those! Equipped with two top handles, you can effortlessly move this dog crate around your house. Another plus point is that it can also be used with different types of crate pads to provide the pooch with an added layer of comfort. 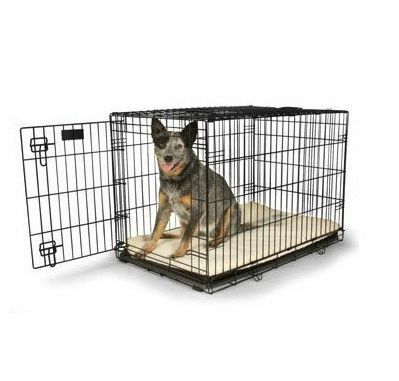 On the whole, this dog cage is a straightforward and easy-to-maintain product, which helps to keep your pooch happy. While it provides the four-legged creature with a personal space of its own; dog owners can benefited by using it as well because it is a great tool to housetrain their beloved canine. The wired kennel is of a sturdy build, easy to assemble and fold back, spacious enough for the animal to lie down with a leg stretched, and overall safe and secure by all means. However, some users may occasionally find their dogs to escape from inside, due to the simple lock system. Other than this, the crate is absolutely fuss-free and affordable. Aren’t you excited to try this crate already? Buy it to try it! 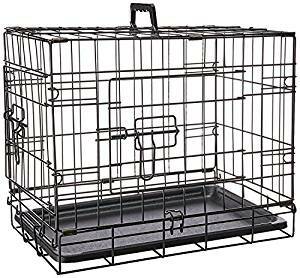 Petco is undoubtedly one of the most reputable American pet products manufacturer and this classic dog crate is live upto expectations. it includes divider panel and slide-out plastic tray for easy cleaning. DoggoCrate is made with love for doggo lovers. Read guides on buying crates for dog, dog crates suitable for small or large dogs etc. 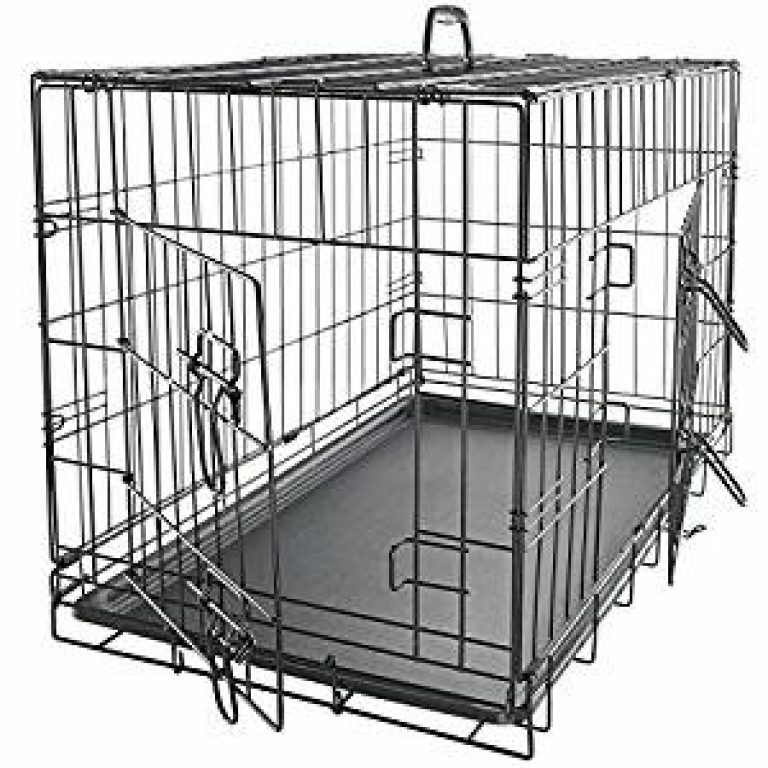 Read updated dog crate reviews or browse top dog cages by size, purpose and material. Or you can just look at those adorable doggos doing their doggo stuff in our media gallery.